These are the ORIGINAL TOOTH FAIRY COIN SETS, designed and patented by Montana Artist Dawn Duane ! 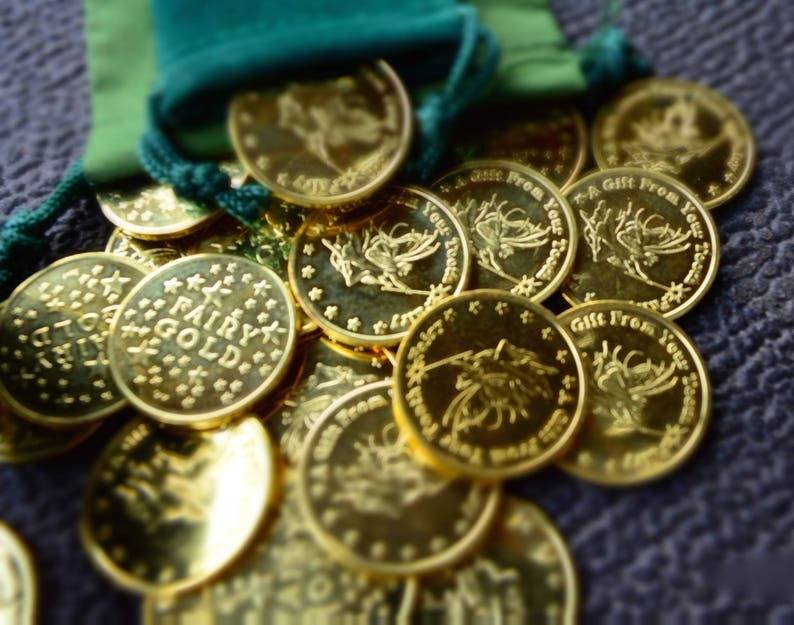 This gorgeous set of twenty Golden Coins (one coin for each of your child's baby teeth). They will be delivered to you door in a discreet manilla package. Housed in a green velour bag, you get twenty two sided magical coins. The gold medallions have as an ethereal embossed image of the Tooth Fairy in all her glory. The back of coin is dappled with stars and the words FAIRY GOLD. These coins are larger than a quarter and smaller than a monocle. They are artistically designed and professionally minted at a regional foundry in Florida. Sold to families all over the globe. Enjoy the magic and the free shipping! Designed as a keepsake for a very special time for you and your child. The golden color illuminating from the coins comes from brass, zinc and copper. OMG! These are so cute and I can’t wait for her to lose that first tooth! Super fast shipping too!